10 A None No Power Seat 10 A is a standard Upper Class seat. 10 K None No Power Seat 10 K is a standard Upper Class seat. 11 A None No Power Seat 11 A is an Upper Class seat however the close proximity to the bar may be bothersome. 11 K None No Power Seat 11 K is an Upper Class seat however the close proximity to the bar may be bothersome. 12 A None No Power Seat 12 A is an Upper Class seat however the close proximity to the bar may be bothersome. 12 K None No Power Seat 12 K is an Upper Class seat however the close proximity to the bar may be bothersome. 14 A None No Power Seat 14 A is a Premium Economy Bulkhead seat that may have extra legroom, however the close proximity to the lavatories and galley may be bothersome. There is no floor storage for this seat during take-off and landing. 14 C None No Power Seat 14 C is a Premium Economy Bulkhead seat that may have extra legroom, however the close proximity to the lavatories and galley may be bothersome. There is no floor storage for this seat during take-off and landing. 14 D None No Power Seat 14 D is a Premium Economy Bulkhead seat that may have extra legroom, however the close proximity to the lavatories and galley may be bothersome. There is no floor storage for this seat during take-off and landing. 14 E None No Power Seat 14 E is a Premium Economy Bulkhead seat that may have extra legroom, however the close proximity to the lavatories and galley may be bothersome. There is no floor storage for this seat during take-off and landing. 14 F None No Power Seat 14 F is a Premium Economy Bulkhead seat that may have extra legroom, however the close proximity to the lavatories and galley may be bothersome. There is no floor storage for this seat during take-off and landing. 14 G None No Power Seat 14 G is a Premium Economy Bulkhead seat that may have extra legroom, however the close proximity to the lavatories and galley may be bothersome. There is no floor storage for this seat during take-off and landing. 14 H None No Power Seat 14 H is a Premium Economy Bulkhead seat that may have extra legroom, however the close proximity to the lavatories and galley may be bothersome. There is no floor storage for this seat during take-off and landing. 14 K None No Power Seat 14 K is a Premium Economy Bulkhead seat that may have extra legroom, however the close proximity to the lavatories and galley may be bothersome. There is no floor storage for this seat during take-off and landing. 15 C None No Power Seat 15 C is a standard Premium Economy seat. 15 G None No Power Seat 15 G is a standard Premium Economy seat. 15 H None No Power Seat 15 H is a standard Premium Economy seat. 18 A None No Power Seat 18 A is a standard Premium Economy seat. 18 C None No Power Seat 18 C is a standard Premium Economy seat. 18 G None No Power Seat 18 G is a Premium Economy class seat whose proximity to the lavatory may be bothersome. 18 H None No Power Seat 18 H is a Premium Economy class seat in the last row of the cabin that may have limited recline. The close proximity to the lavatory may be bothersome. 18 K None No Power Seat 18 K is a Premium Economy class seat in the last row of the cabin that may have limited recline. The close proximity to the lavatory may be bothersome. 19 A None No Power Seat 19 A is a standard Premium Economy seat. 19 C None No Power Seat 19 C is a standard Premium Economy seat. 19 D None No Power Seat 19 D is a standard Premium Economy seat. 19 E None No Power Seat 19 E is a standard Premium Economy seat. 19 F None No Power Seat 19 F is a standard Premium Economy seat. 19 G None No Power Seat 19 G is a Premium Economy class seat whose proximity to the lavatory may be bothersome. 20 A None No Power Seat 20 A is a Premium Economy Bulkhead seat whose proximity to the lavatory may be bothersome. The tray table is in the armrest, making the armrest immovable and slightly reducing seat width. 20 C None No Power Seat 20 C is a Premium Economy Bulkhead seat whose proximity to the lavatory may be bothersome. The tray table is in the armrest, making the armrest immovable and slightly reducing seat width. 20 H None No Power Seat 20 H is a Premium Economy Bulkhead seat whose proximity to the lavatory may be bothersome. The tray table is in the armrest, making the armrest immovable and slightly reducing seat width. 20 K None No Power Seat 20 K is a Premium Economy Bulkhead seat whose proximity to the lavatory may be bothersome. The tray table is in the armrest, making the armrest immovable and slightly reducing seat width. 21 A None No Power Seat 21 A is a standard Premium Economy Class seat. 21 C None No Power Seat 21 C is a standard Premium Economy Class seat. 21 H None No Power Seat 21 H is a standard Premium Economy Class seat. 21 K None No Power Seat 21 K is a standard Premium Economy Class seat. 22 A None No Power Seat 22 A is a standard Premium Economy Class seat. 22 C None No Power Seat 22 C is a standard Premium Economy Class seat. 22 H None No Power Seat 22 H is a standard Premium Economy Class seat. 22 K None No Power Seat 22 K is a standard Premium Economy Class seat. 25 A None No Power Seat 25 A is an Economy Class seat that may have extra legroom due to the exit row in front, however the close proximity to the galley may be bothersome. The tray table is in the armrest, making the armrest immovable and slightly reducing seat width. 25 B None No Power Seat 25 B is an Economy Class seat that may have extra legroom due to the exit row in front, however the close proximity to the galley may be bothersome. The tray table is in the armrest, making the armrest immovable and slightly reducing seat width. 25 C None No Power Seat 25 C is an Economy Class seat that may have extra legroom due to the exit row in front, however the close proximity to the galley may be bothersome. The tray table is in the armrest, making the armrest immovable and slightly reducing seat width. 25 H None No Power Seat 25 H is an Economy Class seat that may have extra legroom due to the exit row in front, however the close proximity to the galley may be bothersome. The tray table is in the armrest, making the armrest immovable and slightly reducing seat width. 25 J None No Power Seat 25 J is an Economy Class seat that may have extra legroom due to the exit row in front, however the close proximity to the galley may be bothersome. The tray table is in the armrest, making the armrest immovable and slightly reducing seat width. 25 K None No Power Seat 25 K is an Economy Class seat that may have extra legroom due to the exit row in front, however the close proximity to the galley may be bothersome. The tray table is in the armrest, making the armrest immovable and slightly reducing seat width. 26 C None No Power Seat 26 C is an Economy Class seat whose proximity to the galley and stairs may be bothersome. 26 H None No Power Seat 26 H is an Economy Class seat whose proximity to the galley and stairs may be bothersome. 27 C None No Power Seat 27 C is an Economy Class seat whose proximity to the galley and stairs may be bothersome. 27 H None No Power Seat 27 H is an Economy Class seat whose proximity to the galley and stairs may be bothersome. 28 C None No Power Seat 28 C is an Economy Class seat whose proximity to the galley and stairs may be bothersome. 28 H None No Power Seat 28 H is an Economy Class seat whose proximity to the galley and stairs may be bothersome. 29 C None No Power Seat 29 C is an Economy Class seat whose proximity to the galley and stairs may be bothersome. 29 H None No Power Seat 29 H is an Economy Class seat whose proximity to the galley and stairs may be bothersome. 30 D None No Power Seat 30 D is an Economy Class seat that may have extra legroom due to the position of the bulkhead in front, however the close proximity to the galley may be bothersome. The tray table is in the armrest, making the armrest immovable and slightly reducing seat width. 30 E None No Power Seat 30 E is an Economy Class seat that may have extra legroom due to the position of the bulkhead in front, however the close proximity to the galley may be bothersome. The tray table is in the armrest, making the armrest immovable and slightly reducing seat width. 30 F None No Power Seat 30 F is an Economy Class seat that may have extra legroom due to the position of the bulkhead in front, however the close proximity to the galley may be bothersome. The tray table is in the armrest, making the armrest immovable and slightly reducing seat width. 30 G None No Power Seat 30 G is an Economy Class seat that may have extra legroom due to the position of the bulkhead in front, however the close proximity to the galley may be bothersome. The tray table is in the armrest, making the armrest immovable and slightly reducing seat width. 33 A None No Power Seat 33 A is an Economy Class seat with a misaligned window. 33 K None No Power Seat 33 K is an Economy Class seat with a misaligned window. 34 A None No Power Seat 34 A is an Economy Class seat with a misaligned window. 34 K None No Power Seat 34 K is an Economy Class seat with a misaligned window. 37 A None No Power Seat 37 A is an Economy Class seat in the last row of the section that may have limited recline and the close proximity to the lavatory may be bothersome. 37 B None No Power Seat 37 B is an Economy Class seat in the last row of the section that may have limited recline and the close proximity to the lavatory may be bothersome. 37 C None No Power Seat 37 C is an Economy Class seat in the last row of the section that may have limited recline and the close proximity to the lavatory may be bothersome. 37 D None No Power Seat 37 D is an Economy Class seat in the last row of the section that may have limited recline and the close proximity to the lavatory may be bothersome. 37 E None No Power Seat 37 E is an Economy Class seat in the last row of the section that may have limited recline and the close proximity to the lavatory may be bothersome. 37 F None No Power Seat 37 F is an Economy Class seat in the last row of the section that may have limited recline and the close proximity to the lavatory may be bothersome. 37 G None No Power Seat 37 G is an Economy Class seat in the last row of the section that may have limited recline and the close proximity to the lavatory may be bothersome. 37 H None No Power Seat 37 H is an Economy Class seat in the last row of the section that may have limited recline and the close proximity to the lavatory may be bothersome. 37 J None No Power Seat 37 J is an Economy Class seat in the last row of the section that may have limited recline and the close proximity to the lavatory may be bothersome. 37 K None No Power Seat 37 K is an Economy Class seat in the last row of the section that may have limited recline and the close proximity to the lavatory may be bothersome. 38 A None No Power Seat 38 A is an Economy Class seat that has extra legroom due to the exit row in front however, the exit door may protrude into some of this space. The close proximity to the lavatory may be bothersome. The tray table is in the armrest, making the armrest immovable and slightly reducing seat width. 38 B None No Power Seat 38 B is an Economy Class seat that has extra legroom due to the exit in front however, the close proximity to the lavatory may be bothersome. The tray table is in the armrest, making the armrest immovable and slightly reducing seat width. 38 C None No Power Seat 38 C is an Economy Class seat that has extra legroom due to the exit in front however, the close proximity to the lavatory may be bothersome. The tray table is in the armrest, making the armrest immovable and slightly reducing seat width. 38 H None No Power Seat 38 H is an Economy Class seat that has extra legroom due to the exit in front however, the close proximity to the lavatory may be bothersome. The tray table is in the armrest, making the armrest immovable and slightly reducing seat width. 38 J None No Power Seat 38 J is an Economy Class seat that has extra legroom due to the exit in front however, the close proximity to the lavatory may be bothersome. The tray table is in the armrest, making the armrest immovable and slightly reducing seat width. 38 K None No Power Seat 38 K is an Economy Class seat that has extra legroom due to the exit row in front however, the exit door may protrude into some of this space. The close proximity to the lavatory may be bothersome. The tray table is in the armrest, making the armrest immovable and slightly reducing seat width. 39 A None No Power Seat 39 A is a standard Economy Class seat that Virgin Atlantic designates as an Extra Legroom seat with an additional 3" of seat pitch. An extra charge must be paid to reserve this seat. 39 B None No Power Seat 39 B is a standard Economy Class seat that Virgin Atlantic designates as an Extra Legroom seat with an additional 3" of seat pitch. An extra charge must be paid to reserve this seat. 39 C None No Power Seat 39 C is a standard Economy Class seat that Virgin Atlantic designates as an Extra Legroom seat with an additional 3" of seat pitch however, the proximity to the lavatory may be bothersome. An extra charge must be paid to reserve this seat. 39 H None No Power Seat 39 H is a standard Economy Class seat that Virgin Atlantic designates as an Extra Legroom seat with an additional 3" of seat pitch however, the proximity to the lavatory may be bothersome. An extra charge must be paid to reserve this seat. 39 J None No Power Seat 39 J is a standard Economy Class seat that Virgin Atlantic designates as an Extra Legroom seat with an additional 3" of seat pitch. An extra charge must be paid to reserve this seat. 39 K None No Power Seat 39 K is a standard Economy Class seat that Virgin Atlantic designates as an Extra Legroom seat with an additional 3" of seat pitch. An extra charge must be paid to reserve this seat. 40 A None No Power Seat 40 A is a standard Economy Class seat that Virgin Atlantic designates as an Extra Legroom seat with an additional 3" of seat pitch. An extra charge must be paid to reserve this seat. 40 B None No Power Seat 40 B is a standard Economy Class seat that Virgin Atlantic designates as an Extra Legroom seat with an additional 3" of seat pitch. An extra charge must be paid to reserve this seat. 40 C None No Power Seat 40 C is a standard Economy Class seat that Virgin Atlantic designates as an Extra Legroom seat with an additional 3" of seat pitch. An extra charge must be paid to reserve this seat. 40 D None No Power Seat 40 D is an Economy Class seat that may have extra legroom due to the position of the bulkhead in front, however the close proximity to the lavatory may be bothersome. The tray table is in the armrest, making the armrest immovable and slightly reducing seat width. 40 E None No Power Seat 40 E is an Economy Class seat that may have extra legroom due to the position of the bulkhead in front, however the close proximity to the lavatory may be bothersome. The tray table is in the armrest, making the armrest immovable and slightly reducing seat width. 40 F None No Power Seat 40 F is an Economy Class seat that may have extra legroom due to the position of the bulkhead in front, however the close proximity to the lavatory may be bothersome. The tray table is in the armrest, making the armrest immovable and slightly reducing seat width. 40 G None No Power Seat 40 G is an Economy Class seat that may have extra legroom due to the position of the bulkhead in front, however the close proximity to the lavatory may be bothersome. The tray table is in the armrest, making the armrest immovable and slightly reducing seat width. 40 H None No Power Seat 40 H is a standard Economy Class seat that Virgin Atlantic designates as an Extra Legroom seat with an additional 3" of seat pitch. An extra charge must be paid to reserve this seat. 40 J None No Power Seat 40 J is a standard Economy Class seat that Virgin Atlantic designates as an Extra Legroom seat with an additional 3" of seat pitch. An extra charge must be paid to reserve this seat. 40 K None No Power Seat 40 K is a standard Economy Class seat that Virgin Atlantic designates as an Extra Legroom seat with an additional 3" of seat pitch. An extra charge must be paid to reserve this seat. 41 A None No Power Seat 41 A is a standard Economy Class seat that Virgin Atlantic designates as an Extra Legroom seat with an additional 3" of seat pitch. An extra charge must be paid to reserve this seat. 41 B None No Power Seat 41 B is a standard Economy Class seat that Virgin Atlantic designates as an Extra Legroom seat with an additional 3" of seat pitch. An extra charge must be paid to reserve this seat. 41 C None No Power Seat 41 C is a standard Economy Class seat that Virgin Atlantic designates as an Extra Legroom seat with an additional 3" of seat pitch. An extra charge must be paid to reserve this seat. 41 H None No Power Seat 41 H is a standard Economy Class seat that Virgin Atlantic designates as an Extra Legroom seat with an additional 3" of seat pitch. An extra charge must be paid to reserve this seat. 41 J None No Power Seat 41 J is a standard Economy Class seat that Virgin Atlantic designates as an Extra Legroom seat with an additional 3" of seat pitch. An extra charge must be paid to reserve this seat. 41 K None No Power Seat 41 K is a standard Economy Class seat that Virgin Atlantic designates as an Extra Legroom seat with an additional 3" of seat pitch. An extra charge must be paid to reserve this seat. 42 A None No Power Seat 42 A is a standard Economy Class seat that Virgin Atlantic designates as an Extra Legroom seat with an additional 3" of seat pitch. An extra charge must be paid to reserve this seat. 42 B None No Power Seat 42 B is a standard Economy Class seat that Virgin Atlantic designates as an Extra Legroom seat with an additional 3" of seat pitch. An extra charge must be paid to reserve this seat. 42 C None No Power Seat 42 C is a standard Economy Class seat that Virgin Atlantic designates as an Extra Legroom seat with an additional 3" of seat pitch. An extra charge must be paid to reserve this seat. 42 H None No Power Seat 42 H is a standard Economy Class seat that Virgin Atlantic designates as an Extra Legroom seat with an additional 3" of seat pitch. An extra charge must be paid to reserve this seat. 42 J None No Power Seat 42 J is a standard Economy Class seat that Virgin Atlantic designates as an Extra Legroom seat with an additional 3" of seat pitch. An extra charge must be paid to reserve this seat. 42 K None No Power Seat 42 K is a standard Economy Class seat that Virgin Atlantic designates as an Extra Legroom seat with an additional 3" of seat pitch. An extra charge must be paid to reserve this seat. 43 A None No Power Seat 43 A is a standard Economy Class seat that Virgin Atlantic designates as an Extra Legroom seat with an additional 3" of seat pitch. An extra charge must be paid to reserve this seat. 43 B None No Power Seat 43 B is a standard Economy Class seat that Virgin Atlantic designates as an Extra Legroom seat with an additional 3" of seat pitch. An extra charge must be paid to reserve this seat. 43 C None No Power Seat 43 C is a standard Economy Class seat that Virgin Atlantic designates as an Extra Legroom seat with an additional 3" of seat pitch. An extra charge must be paid to reserve this seat. 43 H None No Power Seat 43 H is a standard Economy Class seat that Virgin Atlantic designates as an Extra Legroom seat with an additional 3" of seat pitch. An extra charge must be paid to reserve this seat. 43 J None No Power Seat 43 J is a standard Economy Class seat that Virgin Atlantic designates as an Extra Legroom seat with an additional 3" of seat pitch. An extra charge must be paid to reserve this seat. 43 K None No Power Seat 43 K is a standard Economy Class seat that Virgin Atlantic designates as an Extra Legroom seat with an additional 3" of seat pitch. An extra charge must be paid to reserve this seat. 46 C None No Power Seat 46 C is an Economy Class seat whose proximity to the galley may be bothersome. 46 D None No Power Seat 46 D is an Economy Class seat in the last row of the section that may have limited recline and the close proximity to the galley may be bothersome. 46 E None No Power Seat 46 E is an Economy Class seat in the last row of the section that may have limited recline and the close proximity to the galley may be bothersome. 46 F None No Power Seat 46 F is an Economy Class seat in the last row of the section that may have limited recline and the close proximity to the galley may be bothersome. 46 G None No Power Seat 46 G is an Economy Class seat in the last row of the section that may have limited recline and the close proximity to the galley may be bothersome. 46 H None No Power Seat 46 H is an Economy Class seat whose proximity to the galley may be bothersome. 46 J None No Power Seat 46 J is an Economy Class seat in the last row of the section that may have limited recline and the close proximity to the galley may be bothersome. 47 A None No Power Seat 47 A is an Economy Class seat in the last row of the section that may have limited recline and the close proximity to the galley may be bothersome. 47 B None No Power Seat 47 B is an Economy Class seat in the last row of the section that may have limited recline and the close proximity to the galley may be bothersome. 47 C None No Power Seat 47 C is an Economy Class seat in the last row of the section that may have limited recline and the close proximity to the galley may be bothersome. 47 H None No Power Seat 47 H is an Economy Class seat in the last row of the section that may have limited recline and the close proximity to the galley may be bothersome. 47 J None No Power Seat 47 J is an Economy Class seat in the last row of the section that may have limited recline and the close proximity to the galley may be bothersome. 47 K None No Power Seat 47 K is an Economy Class seat in the last row of the section that may have limited recline and the close proximity to the galley may be bothersome. 49 A None No Power Seat 49 A is an Economy Class exit row seat whose legroom may be restricted by the protrusion of the exit door. The close proximity to the galley may be bothersome. The tray table is in the armrest, making the armrest immovable and slightly reducing seat width. 49 B None No Power Seat 49 B is an Economy Class seat that has extra legroom due to the exit row in front. The close proximity to the galley may be bothersome. The tray table is in the armrest, making the armrest immovable and slightly reducing seat width. 49 C None No Power Seat 49 C is an Economy Class seat that has extra legroom due to the exit row in front. The close proximity to the galley may be bothersome. The tray table is in the armrest, making the armrest immovable and slightly reducing seat width. 49 H None No Power Seat 49 H is an Economy Class seat that has extra legroom due to the exit row in front. The close proximity to the galley may be bothersome. The tray table is in the armrest, making the armrest immovable and slightly reducing seat width. 49 J None No Power Seat 49 J is an Economy Class seat that has extra legroom due to the exit row in front. The close proximity to the galley may be bothersome. The tray table is in the armrest, making the armrest immovable and slightly reducing seat width. 49 K None No Power Seat 49 K is an Economy Class exit row seat whose legroom may be restricted by the protrusion of the exit door. The close proximity to the galley may be bothersome. The tray table is in the armrest, making the armrest immovable and slightly reducing seat width. 50 C None No Power Seat 50 C is an Economy Class seat whose close proximity to the galley may be bothersome. 50 H None No Power Seat 50 H is an Economy Class seat whose close proximity to the galley may be bothersome. 51 C None No Power Seat 51 C is an Economy Class seat whose close proximity to the galley may be bothersome. 51 H None No Power Seat 51 H is an Economy Class seat whose close proximity to the galley may be bothersome. 52 C None No Power Seat 52 C is an Economy Class seat whose close proximity to the galley may be bothersome. 52 H None No Power Seat 52 H is an Economy Class seat whose close proximity to the galley may be bothersome. 53 D None No Power Seat 53 D is an Economy Class seat that may have extra legroom due to the position of the bulkhead in front, however the close proximity to the galley may be bothersome. The tray table is in the armrest, making the armrest immovable and slightly reducing seat width. 53 E None No Power Seat 53 E is an Economy Class seat that may have extra legroom due to the position of the bulkhead in front, however the close proximity to the galley may be bothersome. The tray table is in the armrest, making the armrest immovable and slightly reducing seat width. 53 F None No Power Seat 53 F is an Economy Class seat that may have extra legroom due to the position of the bulkhead in front, however the close proximity to the galley may be bothersome. The tray table is in the armrest, making the armrest immovable and slightly reducing seat width. 53 G None No Power Seat 53 G is an Economy Class seat that may have extra legroom due to the position of the bulkhead in front, however the close proximity to the galley may be bothersome. The tray table is in the armrest, making the armrest immovable and slightly reducing seat width. 6 A None No Power Seat 6 A is an Upper Class Bulkhead seat. This seat may be preferable for those traveling with a partner as the seats at the front of the plane are closer together. 6 K None No Power Seat 6 K is an Upper Class Bulkhead seat. This seat may be preferable for those traveling with a partner as the seats at the front of the plane are closer together. 60 K None No Power Seat 60 K is an Economy Class seat that is missing a window. 61 A None No Power Seat 61 A is an Economy Class seat that may be preferable for those traveling with a partner as it is one of the only coupled Economy Class seats. There is extra space for this seat as there is no window seat next to it, however there is also no wall next to the seat to lean your head against. 61 C None No Power Seat 61 C is an Economy Class seat that may be preferable for those traveling with a partner as it is one of the only coupled Economy Class seats. 61 H None No Power Seat 61 H is an Economy Class seat that may be preferable for those traveling with a partner as it is one of the only coupled Economy Class seats. 61 K None No Power Seat 61 K is an Economy Class seat that may be preferable for those traveling with a partner as it is one of the only coupled Economy Class seats. There is extra space for this seat as there is no window seat next to it, however there is also no wall next to the seat to lean your head against. 62 A None No Power Seat 62 A is an Economy Class seat that may be preferable for those traveling with a partner as it is one of the only coupled Economy Class seats. There is extra space for this seat as there is no window seat next to it, however there is also no wall next to the seat to lean your head against. 62 C None No Power Seat 62 C is an Economy Class seat that may be preferable for those traveling with a partner as it is one of the only coupled Economy Class seats. 62 H None No Power Seat 62 H is an Economy Class seat that may be preferable for those traveling with a partner as it is one of the only coupled Economy Class seats. 62 K None No Power Seat 62 K is an Economy Class seat that may be preferable for those traveling with a partner as it is one of the only coupled Economy Class seats. There is extra space for this seat as there is no window seat next to it, however there is also no wall next to the seat to lean your head against. 63 A None No Power Seat 63 A is an Economy Class seat that may be preferable for those traveling with a partner as it is one of the only coupled Economy Class seats. There is extra space for this seat as there is no window seat next to it, however there is also no wall next to the seat to lean your head against. 63 C None No Power Seat 63 C is an Economy Class seat that may be preferable for those traveling with a partner as it is one of the only coupled Economy Class seats. 63 H None No Power Seat 63 H is an Economy Class seat that may be preferable for those traveling with a partner as it is one of the only coupled Economy Class seats. 63 K None No Power Seat 63 K is an Economy Class seat that may be preferable for those traveling with a partner as it is one of the only coupled Economy Class seats. There is extra space for this seat as there is no window seat next to it, however there is also no wall next to the seat to lean your head against. 64 A None No Power Seat 64 A is an Economy Class seat in the last row of the plane that may have limited recline. However this seat may be preferable for those traveling with a partner as it is one of the only coupled Economy Class seats. There is extra space for this seat as there is no window seat next to it, however there is also no wall next to the seat to lean your head against. 64 C None No Power Seat 64 C is an Economy Class seat in the last row of the plane that may have limited recline. However this seat may be preferable for those traveling with a partner as it is one of the only coupled Economy Class seats. 64 H None No Power Seat 64 H is an Economy Class seat in the last row of the plane that may have limited recline. However this seat may be preferable for those traveling with a partner as it is one of the only coupled Economy Class seats. 64 K None No Power Seat 64 K is an Economy Class seat in the last row of the plane that may have limited recline. However this seat may be preferable for those traveling with a partner as it is one of the only coupled Economy Class seats. There is extra space for this seat as there is no window seat next to it, however there is also no wall next to the seat to lean your head against. 65 D None No Power Seat 65 D is an Economy Class seat whose proximity to the tail of the plane and the lavatories may be bothersome as this can be a high traffic area. 65 G None No Power Seat 65 G is an Economy Class seat whose proximity to the tail of the plane and the lavatories may be bothersome as this can be a high traffic area. 66 D None No Power Seat 66 D is an Economy Class seat in the last row of the plane that may have limited recline. The close proximity to the tail of the plane and the lavatories may be bothersome as this can be a high traffic area. 66 E None No Power Seat 66 E is an Economy Class seat in the last row of the plane that may have limited recline. The close proximity to the tail of the plane and the lavatories may be bothersome as this can be a high traffic area. 66 F None No Power Seat 66 F is an Economy Class seat in the last row of the plane that may have limited recline. The close proximity to the tail of the plane and the lavatories may be bothersome as this can be a high traffic area. 66 G None No Power Seat 66 G is an Economy Class seat in the last row of the plane that may have limited recline. The close proximity to the tail of the plane and the lavatories may be bothersome as this can be a high traffic area. 7 A None No Power Seat 7 A is a standard Upper Class seat. 7 K None No Power Seat 7 K is a standard Upper Class seat. 75 A None No Power Seat 75 A is an Economy Class seat that has extra legroom due to the exit row in front. The tray table and TV is in the armrest, making the armrest immovable and slightly reducing seat width. 75 B None No Power Seat 75 B is an Economy Class seat that has extra legroom due to the exit row in front. The tray table and TV is in the armrest, making the armrest immovable and slightly reducing seat width. 75 C None No Power Seat 75 C is an Economy Class seat that has extra legroom due to the exit row in front. The tray table and TV is in the armrest, making the armrest immovable and slightly reducing seat width. 75 H None No Power Seat 75 H is an Economy Class seat that has extra legroom due to the exit row in front. The tray table and TV is in the armrest, making the armrest immovable and slightly reducing seat width. 75 J None No Power Seat 75 J is an Economy Class seat that has extra legroom due to the exit row in front. The tray table and TV is in the armrest, making the armrest immovable and slightly reducing seat width. 75 K None No Power Seat 75 K is an Economy Class seat that has extra legroom due to the exit row in front. The tray table and TV is in the armrest, making the armrest immovable and slightly reducing seat width. 76 A None No Power Seat 76 A is an Economy Class seat in the upper deck of the plane. A seat in this cabin may have a more private feel and quiet ambiance than an Economy Class seat in the main deck of the plane. 76 B None No Power Seat 76 B is an Economy Class seat in the upper deck of the plane. A seat in this cabin may have a more private feel and quiet ambiance than an Economy Class seat in the main deck of the plane. 76 C None No Power Seat 76 C is an Economy Class seat in the upper deck of the plane. A seat in this cabin may have a more private feel and quiet ambiance than an Economy Class seat in the main deck of the plane. 76 H None No Power Seat 76 H is an Economy Class seat in the upper deck of the plane. A seat in this cabin may have a more private feel and quiet ambiance than an Economy Class seat in the main deck of the plane. Legroom may be restricted due to the presence of an entertainment equipment box. 76 J None No Power Seat 76 J is an Economy Class seat in the upper deck of the plane. A seat in this cabin may have a more private feel and quiet ambiance than an Economy Class seat in the main deck of the plane. 76 K None No Power Seat 76 K is an Economy Class seat in the upper deck of the plane. A seat in this cabin may have a more private feel and quiet ambiance than an Economy Class seat in the main deck of the plane. 77 A None No Power Seat 77 A is an Economy Class seat in the upper deck of the plane. A seat in this cabin may have a more private feel and quiet ambiance than an Economy Class seat in the main deck of the plane. 77 B None No Power Seat 77 B is an Economy Class seat in the upper deck of the plane. A seat in this cabin may have a more private feel and quiet ambiance than an Economy Class seat in the main deck of the plane. 77 C None No Power Seat 77 C is an Economy Class seat in the upper deck of the plane. A seat in this cabin may have a more private feel and quiet ambiance than an Economy Class seat in the main deck of the plane. 77 H None No Power Seat 77 H is an Economy Class seat in the upper deck of the plane. A seat in this cabin may have a more private feel and quiet ambiance than an Economy Class seat in the main deck of the plane. 77 J None No Power Seat 77 J is an Economy Class seat in the upper deck of the plane. A seat in this cabin may have a more private feel and quiet ambiance than an Economy Class seat in the main deck of the plane. 77 K None No Power Seat 77 K is an Economy Class seat in the upper deck of the plane. A seat in this cabin may have a more private feel and quiet ambiance than an Economy Class seat in the main deck of the plane. 78 A None No Power Seat 78 A is an Economy Class seat in the upper deck of the plane. A seat in this cabin may have a more private feel and quiet ambiance than an Economy Class seat in the main deck of the plane. 78 B None No Power Seat 78 B is an Economy Class seat in the upper deck of the plane. A seat in this cabin may have a more private feel and quiet ambiance than an Economy Class seat in the main deck of the plane. 78 C None No Power Seat 78 C is an Economy Class seat in the upper deck of the plane. A seat in this cabin may have a more private feel and quiet ambiance than an Economy Class seat in the main deck of the plane. 78 H None No Power Seat 78 H is an Economy Class seat in the upper deck of the plane. A seat in this cabin may have a more private feel and quiet ambiance than an Economy Class seat in the main deck of the plane. 78 J None No Power Seat 78 J is an Economy Class seat in the upper deck of the plane. A seat in this cabin may have a more private feel and quiet ambiance than an Economy Class seat in the main deck of the plane. 78 K None No Power Seat 78 K is an Economy Class seat in the upper deck of the plane. A seat in this cabin may have a more private feel and quiet ambiance than an Economy Class seat in the main deck of the plane. 79 A None No Power Seat 79 A is an Economy Class seat in the upper deck of the plane. This seat may have limited recline and the close proximity to the stairs may be bothersome. However, a seat in this cabin may have a more private feel and quiet ambiance than an Economy Class seat in the main deck of the plane. 79 B None No Power Seat 79 B is an Economy Class seat in the upper deck of the plane. This seat may have limited recline and the close proximity to the stairs may be bothersome. However, a seat in this cabin may have a more private feel and quiet ambiance than an Economy Class seat in the main deck of the plane. 79 C None No Power Seat 79 C is an Economy Class seat in the upper deck of the plane. This seat may have limited recline and the close proximity to the stairs may be bothersome. However, a seat in this cabin may have a more private feel and quiet ambiance than an Economy Class seat in the main deck of the plane. 79 H None No Power Seat 79 H is an Economy Class seat in the upper deck of the plane. The close proximity to the stairs may be bothersome. However, a seat in this cabin may have a more private feel and quiet ambiance than an Economy Class seat in the main deck of the plane. 79 J None No Power Seat 79 J is an Economy Class seat in the upper deck of the plane. A seat in this cabin may have a more private feel and quiet ambiance than an Economy Class seat in the main deck of the plane. 79 K None No Power Seat 79 K is an Economy Class seat in the upper deck of the plane. A seat in this cabin may have a more private feel and quiet ambiance than an Economy Class seat in the main deck of the plane. 8 A None No Power Seat 8 A is a standard Upper Class seat. 8 K None No Power Seat 8 K is a standard Upper Class seat. 80 H None No Power Seat 80 H is an Economy Class seat in the upper deck of the plane. This seat may have limited recline and the close proximity to the stairs may be bothersome. However, a seat in this cabin may have a more private feel and quiet ambiance than an Economy Class seat in the main deck of the plane. 80 J None No Power Seat 80 J is an Economy Class seat in the upper deck of the plane. This seat may have limited recline and the close proximity to the stairs may be bothersome. However, a seat in this cabin may have a more private feel and quiet ambiance than an Economy Class seat in the main deck of the plane. 80 K None No Power Seat 80 K is an Economy Class seat in the upper deck of the plane. This seat may have limited recline and the close proximity to the stairs may be bothersome. However, a seat in this cabin may have a more private feel and quiet ambiance than an Economy Class seat in the main deck of the plane. 9 A None No Power Seat 9 A is a standard Upper Class seat. 9 K None No Power Seat 9 K is a standard Upper Class seat. A variety of audio programming is available on Virgin Atlantic's brand new entertainment system JAM. Audio Visual on Demand is available on Virgin Atlantic's new entertainment system JAM, offering over 300 hours of entertainment. AC power ports are available at all Upper Class and Premium Economy seats. There are no AC ports in Economy. The Virgin Atlantic Boeing 747-400 operates in a three class configuration. Cabins include seating in Upper Class, Prem Economy, and Economy. flew 20th March 2019 Manchester to JFK NY. the seat is close to galley but not too close. the seat is as comfortable as you can expect for 7 hours in economy, I managed to sleep which is unknown for me, however, the usb charging port was not working on this flight out, i would recommend this seat. 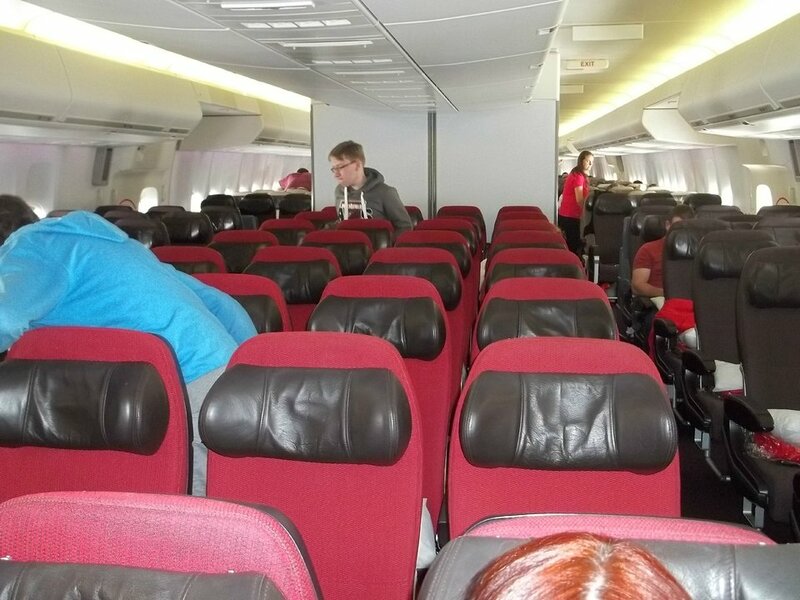 Flew Manchester to Barbados 28/02/19 vs77 and ret 10/03/19 vs78 to Manchester on a Virgin 747-400 and the side lockers adjacent to our seat 79A and B were screw shut and not available to use as on other previous flights and the overhead locker was very small and a struggle to fit in a very small flight bag. The "pod" / upper deck is for me a good choice. Because it is far smaller then the main body of the a/c, there aren't as many people of need of the toilet, hence the queues aren't anywhere near as long. Also if sitting on one of the economy class seats in the upper deck, you have the "privilege" of turning left instead of right - which means you disembark even before the premium economy passengers! A handy perk if you don't like hanging about once back on the ground. In the upper deck or "pod", due to the shape there is a wide, a VERY wide panel at the side of the seat. It allows you to not only have overhead storage, but you have space to put a backpack and shoes in the side, allowing you way more space than the lower deck premium economy seats. Whilst you are closer to the toilets, because the "pod" is far smaller, the queue for the toilets was significantly less. The "disadvantage" is you have to climb a steep staircase to get to the "pod" the advantage for economy seat passengers, is you get served food quicker, because there aren't many premium economy passengers ahead of you. Plus it is as far from the engines & noise as you can get. The upper class cabin on the 747 is small and very well attended. The seat are fine, the entertainment system on these old planes is disappointing, small screens and controls that work badly at best. Food is very good, in my opinion, the staff attentive, and the choice of drinks excellent. Is it worth the price? No. Do you have a great experience and arrive with much more energy? Definitely The seats fold into a flat bed, but they are not very comfortable. Used this seat for a trip to New York with my son as one of the "Economy Delight" packages. Given I had a back problem the seat gave me all the space I needed to stretch out and all in all the flight was very comfortable - ditto for the journey home. Virgin staff as good as ever. Sat in these seats but the light from the toilets on the night flight was a pain as cabin was dark but the constant use of the toilets made the lights a pain when trying to sleep. Great seat! I paid an extra £35 for this seat and it was well worth it. You get use of the big shelf under the window which is also a storage area that is pretty big. I had 9 seats to myself, there was only about 15 of the 33 Economy seats in use in the bubble. It is right that you feel a little better cared for up there, I truly do recommend it. 64K was a good free seat that I would use again if I didn't want to pay for an upgraded seat and if the other 2 seat positions in front were not available. The seat DOES recline and there is some space to the right next to the window. It is not too far away from the window to lean against like the seats in front. Traveled from Orlando to Gatwick. We decided to upgrade to Premium economy to celebrate my recent retirement. We had seats 23A & C (the bubble) for both legs of the flight. All I can say is WOW! The seats are amazing. Very wide and comfortable with lots of leg room. I am 6' tall and had plenty of room to spare. The window seat has a storage area between the seat and window. We were able to put all of out carry on items in it and didn't have to use the overhead bins. The lid also doubles as a place to put your drinks, etc instead of the tray table. The service on Virgin was top notch...as always. We actually enjoyed the flights over and back instead of just "enduring" them. We are going back in a few months and will travel PE again. There is one major drawback to flying PE and that is you will be spoiled and never want to settle for economy again....be careful. Well worth the upgrade. As of Dec 18, seats A and K are £49.00 and seats B and C at £79.00. A and K have more legroom than standard economy classic but are somewhat restricted on the exit row due to the slide/raft attachment on the doors. Foldaway IFE and in seat USB power is included. Seats fine, fully reclined which was perfect for the night time flight back from Orlando but seats are right by the staff area/kitchen so can be noisy if trying to get to sleep. Seats were perfect for us. Close to the staff area/kitchen area so a little noisy but not a problem for the outbound flight to Orlando which was a day time flight. I thought these 2 seats together were fantastic. They do recline. Me and my daughter sat her when we went to Florida and we had them on the way home as well. It had been commented it might be noisey near the toilets but I slept the longest I ever did on the way home for about 7 hours without being disturbed. A really lovely flight. The legroom is great but the seats are so narrow they are uncomfortable. A plus of this seat is the exit row behind - you don't have to worry about reclining into someone! The negative is the overhead space - I want to use the bin above my seat, as it's least disruptive to those around me. Not possible with this seat, as the emergency equipment are stored in this bin. The aisle between the Premium Economy seats is pretty wide, which made moving around the cabin easy. All of the window seats in the upper deck have a ledge next to the window - very convenient for placing all your bits and bobs. The seat back pockets are very small. 41 H,J,K have extra leg room and are good seats. On VS27 from london to Orlando this was a good flight, however the aircraft from Orlando to Gatwick VS28 seemed older and the in flight entertainment sytem for all 3 seats had a faulty touch screen making games impossible to play and 41J screen locked up and was rendered useless. Seats 25A, 25K are a rip-off. The actual emergency door actuator is so large legroom is smaller than a standard seat. We flew round trip in premium economy from Orlando to London in November 2017. All I can say is that it was well worth the extra $370 per person for the upgrade from economy. The leather seats are much bigger, more leg room, reclines more. I highly recommend flying in the bubble over downstairs. Only two rows of seats upstairs (total of 10). It was a lot quieter. Careful though...once you do the upgrade...you will be spoiled. Very limited leg room due to the entertainment system. be prepared to get to know your fellow passengers with the sorry statement. This is supposed to be a premium economy recliner seat but it is very limited on recline and there is no noticeable or discernible difference from it being in the upright position. They seat in front has full recliner capability however so expect to travel with the back of the seat in front in your lap. I would recommend avoiding this seat and 19C. whilst it is nice being in a pair and not having to concern yourself with people behind when reclining (seats fully recline in this position), queues forming for the toilets meant people leaning against the chair & against the headrest whilst waiting. Also being near to an open area meant people congregating and on one occasion changing a nappy which wasn't pleasant. Lots of leg room but seat was tight and aisle very narrow. Avoid row 20 in the upper deck of the 747 at all costs!! 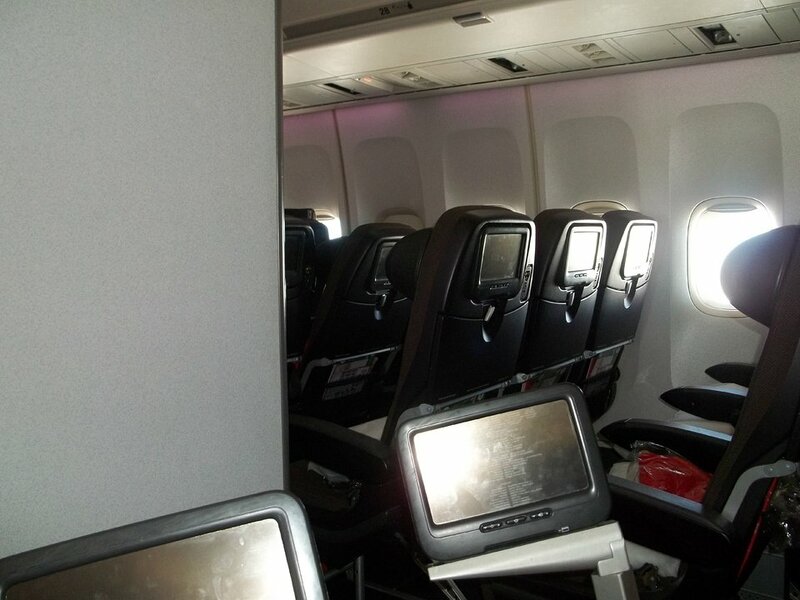 Legroom is drastically inhibited by the bulkhead directly in front of row 20, there are no integral leg rests so cabin crew provide foam cushions and the seats are adjacent to the only two toilet cubicles serving circa 53 passengers and crew in the upper deck area. Do not expect any peace on an overnight flight. Virgin customer services are still adamant that bulkhead passengers get more room - this may be the case on the Airbus 330, but definitely not the case on the Boeing 747. LGW-MCO. 75H has great legroom being an exit row seat. Agree that the seat is quite narrow due to the table and IFE monitor being in the armrest, however if you can live with that, being in the bubble is a great place to be. The designated lavatory is indeed the one at the front of the PE section upstairs near the flight deck, ignore the looks from the people sitting there and stretch your legs out. Good service due to being a mini cabin. Seat was quite comfortable with the extra leg room. The C seats in economy have a cramped area in the footwell. If you want an isle on the left "G" is a better option. Great seats in economy on the upper deck. To re-iterate other reviews - full recline, great side storage and space by the window, excellent quick cabin service, quieter, cosy cabin feel, on and off plane first. Well worth $40 to reserve. Very small overhead storage lockers though, but closet by the galley provided ample storage for hand luggage. I booked the central four seats on row 37 on both VS075 and VS076 to MCO. The seats do not have as stated "limited recline" - the seats reclined as fully as other seats on the plane. When the bank of four toilets got slightly busier, on both flights the people waiting stood in the large open space in front of the extra leg room seats in row 38. There were no smells from the toilets at all. This seat was a total pain as the area to the side has no seats (which seemed a good idea) but in reality it was a 'hand out' area for all and sundry including one man who on a night flight soent most of his time there staring and chatiing (really close to me!!!!) VERY offpjtting and stopped me getting any sleep and this plus toilets behind which meant coming and going constantly meant no sleep and very little privacy. The row in front 65 is also the same problem as flew the other direction in this row. I would also like to add near the virgin staff seats who never stopped chatting and texting! As a 6ft2 person ive found it difficult to find a good economy seat, however 77C is a great seat, loads of leg room, the upper deck cabin is great, really quiet and relaxing, highly reccomend. This seat has a huge area and an emergency exit behind it and there is no restriction on recline. Applies to 64a,64c, 64h and 64k. I was never bothered by latrine users but comments regarding the lack of somewhere to put your head are correct. You also get fed and watered first. Draft circulating around galley made it for a cold journey. These seats, although economy, carry a premium as they are extra legroom and in the 747 "bubble". The big problem is seat width and a further restriction in not being able to lift the arm rest due to meal table stowage. The seat is, therefore, extremely uncomfortable even for relatively slim passengers. LAS to LGW was more endurance than enjoyment. Beware! What nice about this seat is that theres only two, plus the storage on the side for handbag or hand luggage - so don't have to store above your head. Only during take off and landing, items have to be stored under the seat a head of you. Seat has loads of room behind for a full recline, and as nobody is behind you, you can keep it back for the whole flight without annoying the person behind or getting your seat back kicked. Combine this with the storage bin to your side, ample legroom, a quieter cabin and fast service as there are only 6 rows to serve before you. Best economy seat on the plane! Amazing. You get served first. The IFE is a bit unresponsive; so press harder! Legroom is ridiculously generous! It felt much like an extra-legroom seat. I chose the Beef Lasagna for dinner. It was excellent. The seats were also very comfortable, adjustable headrest which I found very good for sleeping. Also a very generous recline. Blanket was quite thick and the pillow was very high-quality. I slept very well. There was also a good amount of shoulder space so you could spread out without nudging the person next to you. Overall, my experience was a 5 star of 5 star. Would definitely fly on this craft again with Virgin Atlantic. we had seats 37 a and b, seats were great because we had nobody kicking the seat behind and reclined just like everyone elses seat. although the is a silver box on the floor of seat 37a which restricted foot space. A seat to avoid, very cramped, no leg room at all, next to window, but not reclinable, bulk head ar rear, very uncomfortable on long flight to Cuba, wrote letter of complaint to Virgin. 747 was full, 20 mins wait for toilet, not acceptable! The legroom is impaired in this seat due to the emergency exit bulge. The other two seats in this row are unaffected. Yes this is the last seat at the back, but the fact that its only two seat instead if three gives you a biy more room along the window for storage and what not ehen flying. The seats in economy in the bubble are fantastic and I would recommend them to anyone. My only gripe is the moaning that all PE passengers moaning about economy passengers using the toilets that are situated at the front of PE. What are they supposed to do? Go downstairs just so they dont get disturbed?!?! Furthermore , what if the toilets were situated in the economy part of the upper deck? Would the economy passengers be entitled to whine then? I understand they pay more money but its not the economy passengers fault where the toilets are situated. A good seat choice. These seats still fully recline the same as the others. Upper deck poor for Premium. Constant stream of people from economy coming forward to use the toilet.Also no chance of getting off first (as per Premium Economy)because you follow at least the economy pax from upstairs - and on our return to the UK, also economy pax from downstairs ! Best advice go economy upstairs ! I found this seat to be ideal. Being on the upper deck it does seem to be much quieter and the view from the window is superb without wings getting in your way. Excellent seat!!! Flew from LGW to Las Vegas. Any extra legroom for this seat due to being in an exit row is completely taken up by the door mechanism. It's a lousy deal compared to the two seats next to it (and cold too). Upper deck Premium Economy cabin, last row of seats before emergency exit. Great having small cabin feeling but a couple of drawbacks. 1. Passengers from economy seats constantly using the forward cabin toilets and was very noisy due to wedding party. 2. Premium Economy passengers gaving NO chance of priority disembarkation from this cabin. On the way to Orlando on the 747 It was amazing. It was fairly quiet for a huge plane with 4 engines and quite a bit of room too. The toilets at the back didn't bother us whatsoever and we got used to it within 1 hour. On return to Manchester Airport we were moved and sat over the wing which was awful. Very loud engine noises, couldn't go to sleep whatsoever. When I say loud engine noises I mean loud.. I recommend sitting at the back as it's less noisy and roomy. We were flying to Vegas from Gatwick. I had prebooked these seats (a and b)well in advance and before discovering seat guru! they cost a considerable amount extra as being sold as extra leg room. the positives- they did have extra leg room being at the front of the economy portion of the plane and right by the door. It was great to be near to the galley as we were served first! It was super to be seated opposite the crew for take-off and landing as they were great! however negatives are- the window seat is right next to the door meaning the person sitting there doesnt get any leg room as once the door is closed it bows inwards thus limiting space. This does impact on the whole row. The seats are emergency exit seats so all bags to be stowed meaning didnt have access to anything until seatbelt signs switched off or you were left clutching your stuff including the paraphernalia you are given, pillow blanket etc. as theres nowhere to put anything. As these are the front seats the armrests are fixed which narrows the seats considerably so what you gain in leg room you lose in ar*e room. Furthermore the tv console raise from the underside of the seat and the tables come from the armrest meaning if all in place you are totally hemmed in! not pleasant at all! Would definitely not recommend these seats . Fortunately we had booked premium economy on the way back which was superb! This seat is right at front of the economy section with the aircraft door so nothing in front of you for about 6 feet, so room to stretch out. There is a wall ahead separating you from premium, and the galley wall to the side, so it does not feel like a large aircraft. The seat is slightly narrow due to lap table and entertainment system in armrest. The premium economy toilet is directly ahead of you, but not bothersome as it was hardly used on either flight (both of which were nearly full) only bad comments are that at night there is a lot of light from the galley in this area, the overhead locker space is behind you and you have no pocket for small items during take off or landing. Even though it is an extra legroom seat it has an entertainment box under the seat in front. This means your legroom is restricted and therefore making paying for the extra room pointless. With this and the vicinity of the toilets its not a great place to sit. There is limited foot room under the seat in front because of an obtruding structure on the left side. Great seats and in my opinion I would rather have these than the ones in Premium Economy. You have all the leg room you could imagine in front of you. Did not find any issues with these at all, great for a 10 hour flight! I flew both ways from Manchester to Orlando in this seat and the 'close proximity to the toilets' didn't bother me at all. The extra legroom was very welcome as was the fact that the people in front didn't recline their seats! The seatback entertainment system was frustrating. It didn't respond to repeated requests and I finally gave up. Seats 39a and k and seats 49a and k should be regarded as bad seats due to the fact the door bulk completely takes away the extra legroom making it worse than a standard seat. However you pay extra for it due to it being regarded as an extra legroom seat. Excellents my Wife and I enjoyed our return trip from Vegas, the ride was quite comfortable absent, several bumps from the weather. Cabin Crew was exceptional. All seats should be like these, so all passengers would ride in comfort. Lovely on the upper deck feels like your own lounge its so quiet.... Well on the night flight back it is anyway!!!!! Sat upstairs on the MAN - MCO return. It was nice and quiet upstairs, it felt like the cabin crew were able to he more attentive. That said the seat is still a basic economy seat. Tough going on a long flight. If the person in front reclines their seat there is no room. Excellent seat, well worth the £45 extra for the exit row. Top deck of the 747 is much quieter than down below, with better service from the flight crew and better storage (side bins for the window seats). The emergency exit door sticks out and is immediately in front of the seat. This means that this seat has less legroom on the right hand side than if there were another row in front, and the only way you can sit without twisting is with your feet flat on the floor and so close to your seat that it's possible that the toes of the (albeit tall) passenger behind touch your heels. Great seats with the extra large bin to the side. The stairs didn't cause us any problems, but on the way home, the crew talking at the back did cause lots of noise. Still better than economy downstairs though! Having booked extra leg roon last FEB to ensure confort and received an email to print out.On Check in at Orlando found out we did not have the seats we booked.They spit myself and my family up with 2 ypung children which was totally unacceptable.Having called for a supervisor we managed to get 4 seats at the very rear of the place which have the worst seat pitch for someone of 6"3.I am a travel director and was very stressed put that I had to stand for most of. The flight as sitting was too uncomfortable.The flight suffered severe turbulance and I had to be told on several occasions to sit down.Worst experience of my life and having come highly recommended by former manager Nicky Cakebread I do not think I will rush to book another flight.I had intended to book for Hawaii in November but now have my doubts. You can recline in peace without worrying about the passenger behind. Lots of legroom and a locker directly beside you where you can store your stuff rather than overhead. It also doubles as a shelf. Virgin offer excellent value for money with PE. Prior embarking before economy but economy passengers upstairs disembarked before PE but before the bulk of E passengers downstairs. Nonetheless, amazing service. We sat in these seats on the way back from Orlando to Manchester. Being an overnight flight, most people want to sleep - understood, but once the seats in front of us were reclined, we could not move at all. It appeared that their seats reclined much further than ours, making for an extremely uncomfortable flight. We were literally left with about 5-6" of room between the seat in front and our faces! All the aisle seats in the upper deck economy have very limited foot space. So that is from row 76 to 80, seats C and H. You can barely put your two feet inside under the seat in front of you. You will then have to put one in the aisle where everyone will hit you while walking or with the food/drinks cart. Middle seat and window seats have a good amount of space. Leg space for this seat is restricted/narrower due to the presence of a square metal equipment box under the seat in front. I have been on this plane 22 times ok legroom great recline on all seats unless your infront of an exit row i traveled premiem economy once much more luxury for a 8 hr flight this plane does the job. On boarding i discovered to my dismay that the arms between these seats only raised halfway. This is the case for all economy seats on the upper deck of this aircraft. If you are on the larger side it makes for a very uncomfortable flight. Also if there was an emergency i would have to question if this limited lifting of the seat arms would hamper/slow down people from exiting the aircraft,as the amount of space between the seats is very limited. My husband who is very fit and able, struggled getting into and out of this seating. Also there is nothing on their seat maps to denote that arms only raise partially to allow you to make an informed choice. The cabin crew were wonderful, so other than the discomfort and problems entering and exiting seats in the cramped cabin, it was a reasonable flight. Booked this seat as being advertised as having extra legroom on the Virgin website, well it doesn't... the door protrudes in so much so I think you may actually have less space for your feet than if you were sat in a normal economy seat. I was happy enough as no one could recline in front of me but if you want it for the extra leg space don't book the window seat! Cramped seat. Constant tapping on back of seat by person behind using touchscreen. Once seat in front reclined early in flight very uncomfortable. Poor food but better than on outbound flight!! Excellent cabin crew. I went th Havana and i got on and soon after take -off my sound did'nt work and when they restarted the system i still did'nt work so i swapped seats and i was fine. Food was excellent and the amount of drinks was overwhelming and overall a good flight. The whole upper deck is an awesome experience. Being secluded from the mass of people below was very peaceful and relaxing. There is plenty of room to stand and walk around and be comfortable during the long flight. The exit row is worth the upgrade. Plenty of room to extend your legs as there is a large space in front of you! We were lucky enough to get this seat both ways in 2014 and it was fantastic. My tall husband had the legroom he needed and the service was excellent. No one in front reclining. The cabin crew were attentive and friendly and I have just booked the same seats for the outbound flight to Cancun this year. No queues for the toilet either!!! I recently flew round trip LAS-LGW. My outbound trip to LGW was in upper class, so needless to say, it was spectacular. Since the return is a daytime flight I didn't see the necessity for upper class so I decided on the upper deck in Premium Economy.I travel overseas a couple of times a year for pleasure and don't understand what all the negative comments are about. I was in 24H. The flight attendants were wonderful and accommodating. The food and drink service was fine, the seats were comfortable and there was no noise nor lines for the WC. I guess there are some who are never satisfied. Returning in Premium from Barbados just before Xmas. Seat very comfortable and the back row is even better, because there is no-one behind who grabs the back of your seat when they stand up! Service and food up to the usual good Virgin standard. upper deck premium was awful. Felt claustrophobic with two toilets a few feet away which meant constant noise of flushing toilet and people queueing up. Cabin crew situated behind economy seats which meant premium did not get the same attention as those sitting in premium downstairs would get. Upper deck premium not worth it. Having read existing comments, I was at the ready to pre-book my seats 60 days in advance. We flew out to LAS economy, but managed to get upstairs, which was very quiet and seemed far more spacious than downstairs. Drinks and meal service was a lot quicker too (than a flight we took from LGW-SFO earlier this year on same plane but seated downstairs economy (65F) - horrible). The great thing about upstairs is the seat height storage buckets (both Econ & Prem Econ) between the seats and windows. This was really handy for handbags and personal effects and far easier to grab anything rather than getting up to the overheads all of the time. We travelled back in Prem Economy, upstairs again. The seats were really comfortable and the recline and foot rest were great on a long overnight flight. The Premium seats upstairs seemed far better than down, I would not have paid to upgrade if I were downstairs, especially in the middle of the cabin in a 4. My only negative comments were that, being a slightly larger lady, I needed an extender for the seat belt, in Premium only, Economy was more than adequate strangely. And on outbound journey, half the toilets on the plane had a technical issue, so the queue was rather long. We had J & K on an overnight they do recline and had more legroom than I am used to. Useful locker at the side of K which was better than overhead as it was available without disturbing anyone else and easily fitted my had luggage. We were near the stairs but as no WC behind us the traffic was minimal and on an overnight the galley was quiet too. Would book this seat and/or cabin again as upper deck is better served being smaller. Premium economy experience not as good in new seating plan of upper deck. Curtain does not give privacy, noise greater and disembarkation slower having to wait for economy passengers to leave first. Not value for money as it once was. Although flight was full there was no queing for the toilet. Excellent service. Plenty of legroom. Travelling back in economy so will update for that seat later!!! Proximity to lavatory more bothersome than other seats with door opening outward towards seat. This seat should be marked in RED as BAD. Worse than standard economy seat- less legroom. The door bulge covers the entire space in front of the seat. No ability to extent feet. Please do not let unknowing travellers become victim to this seat. Loved the side storage pockets, Vera the entertainment centre, the food and excellent service enroute to Cancun. We were not bothered by usuage of the toilet nor by the economy passengers. Would state that the upstairs economy seats on this plane must be the best or any airline. The upstairs seats need to be booked on the 60th day before departure at 8am. Noticed those seated in 20A were soaked by condensation from air con unit above and also they front seats had no loverhead light/air unit as well as no foot rest. Avoid row 20 as also beside the toilet. Leg room good as was exit row but then paid quite a bit extra for this privilege. Seat itself not very comfortable and narrow. Made worse by tray table being in the arm rest which encroaches on your space. Handy storage bin by the side to put things in. I agree with a lot of the comments about the change in seating for Premium Economy. 2 toilets are not enough and for the extra it now costs for this cabin you do not expect to have such large numbers or passengers passing and hanging around in there as there is more room in economy. The problem is when you are in Premium Economy downstairs as really it is just not worth the extra fare as not much better than Economy. I also agree about the way you have to request your seat not a very good system. I have always travelled on Virgin but BA are slowly becoming a better deal. Used this seat for a flight June 22 from Manchester to Orlando with my wife and daughter. Plenty of space for hand luggage and you're served very promptly my the cabin crew. All economy seats on the upper deck were taken within 60 minutes of seats being made available online so be quick! Far better than being downstairs. The premium economy seats in Virgin are superior to BA, no question. This was my first Virgin flight as a BA die-hard of 17 years - I have sat in every PE seat on transatlantic BA flights. The Virgin seats feel like they have appreciably more width to them than BA, making sitting in E and F seats far better. The service/food is comparable to BA. Nothing stands out on the staff of either airline. It is an absolute disaster that PE and E have been mixed on the upper deck. It meant that my friend and I (we had booked together) were unable to be seated together as the seat assignment for virgin is an utterly confusing disgrace. There was one toilet for the whole upper deck so the queue clogged the aisles throughout. When the second toilet broke we all had to go downstairs to the economy toilets (really unfair on the passengers downstairs) We were together downstair for the return and it really was no different to being in economy. I am so disappointed as I have flown to Vegas over 14 times with virgin but think I will be defecting to BA for future trips. 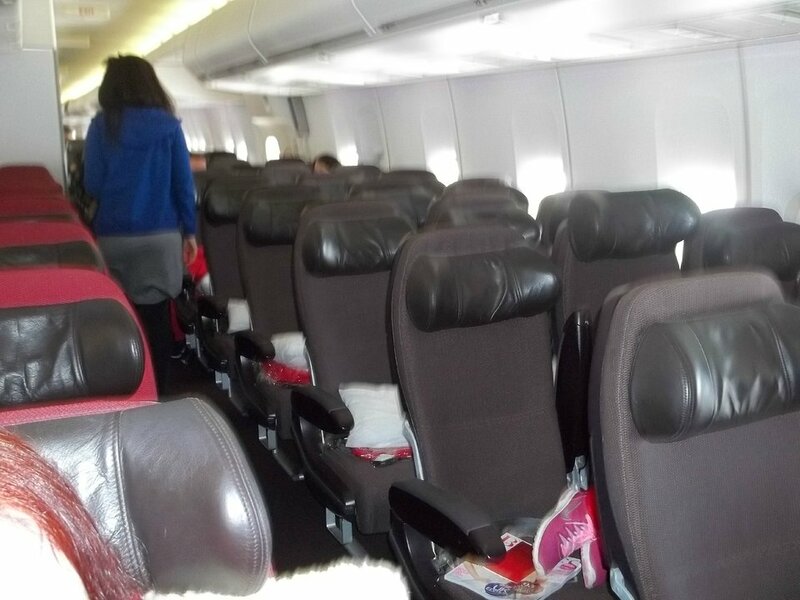 Virgin Atlantic have mixed Premium and economy upstairs on the B747. I would always upgrade to Premium if possible upstairs as it was special. This was a bad move to increase the passengers upstairs. Downstairs in Premium Economy its like a zoo with kids from economy constantly coming through using the bathrooms,playing, running around the cabin..in one curtain out the other. This is why I fly BA now, the triple 777 premium economy is quiet and the cabin staff are on top of things. Sorry Virgin but when you partnered with Delta I had to move on for fear of ending up over the atlantic with grouchy flight attendants and typical no us air carrier service. I really cannot say economy being upstairs with me in PE caused me a major trauma. Toilet issue didnt cause me any problems at all. Plenty of room in the seat and the isle. Cracking deal to get an economy seat up there! massive mistake mixing PE and E together, too many people not enough toilets, i feel i paid all that extra money for nothing, i always said i would never fly BA again, looks like i have to go back on that. sort it out virgin before its too late. Agree with another reviewer that I believe Virgin have made a mistake mixing Premium Econ & Economy together on upper deck! Only two toilets (at the front) on upper deck, for use by the flight deck crew and also 20 PE passengers & 33 Economy passengers. Economy passengers are therefore queuing in isle all through the PE section and at one time on our flight there were 10 people queuing and the flight crew were making passengers stand well back from the cockpit door! Overhead bins are also on small size and some passengers larger carry on cases wouldn't fit in and the crew had to store them at the back! Seats & entertainment generally good although the leather seats can make you hot. Good legroom. Apart from the toilet queuing, it is quieter than downstairs. Although this section of the plane is very spacious, it is also extremely hot and the overhead air vent does not reach you very well as it is behind you. We travelled as a party of 8, 4 being in economy downstairs, and it was a much nicer temperature there. I would rate this seat as REALLY BAD! Having just flown this past week from Orlando to London. I was assigned this seat. Being next door to the bathroom disturbed my ability to rest. The lights, the ordor, the constant flow of folks from the economy section to use the facilities, ruined my evening!!! :( i wish i had found your website before my trip. Virgin Atlantic flies 1 versions of Boeing 747-400.